In my portuguese class I decided to talk about hobbies, the theme was our choice and I thought: why not? In reality it’s something that’s always with me since I’ve too many hobbies (not that I’m always proud of it because I can’t do everything at the same time, unfornately). But the interesting thing is: people who have hobbies that require some kind of thought such as play chess, read, knit, have less 2.5% to have Alzheimer. This might seem not enough but it’s this era’s disease so I’m okay with the numbers. Na minha aula de português decidi falar de hobbies, o tema era livre e eu pensei: porque não? Na realidade é algo que está constantemente em mim visto que eu tenho demasiados hobbies (não é que eu me orgulhe sempre disso porque depois não consigo fazer tudo ao mesmo tempo, infelizmente). Mas algo interessante é: aqueles que têm hobbies que requerem algum pensamento como jogar xadrez, ler, fazer tricot, têm menos 2.5% de probabilidade de ter Alzheimer. Pode até parecer pouco mas é a doença desta era e conformo-me com os números. I was wearing my beautiful sweater (<3) today and I only told selected people that I made it so telling everyone I made it was kind of refreshing. I’ve to say I’m basically ashamed of most of my crafts because I know some people just don’t understand. But I’ve been less ashamed as the time passes. I never thought I’d bring my knitting to the school bus but I do. Eu estava a vestir a minha linda camisola (<3) hoje e apenas tinha dito a um grupo seleccionado que a tinha feito mas dizer a todos que a tinha tricotado foi refrescante. Tenho de admitir que me envergonho da maioria dos meus trabalhos manuais mas à medida do tempo vou ficando menos envergonhada. Nunca pensei em trazer o meu tricot para o autocarro da escola mas trago. Illustrating are photos from my first winter I saw snow in my house (in Portugal). I wish I could see this again this year. A ilustrar estão fotos do primeiro inverno em que vi neve na minha casa (em Portugal). Desejo ver isto outra vez este ano. 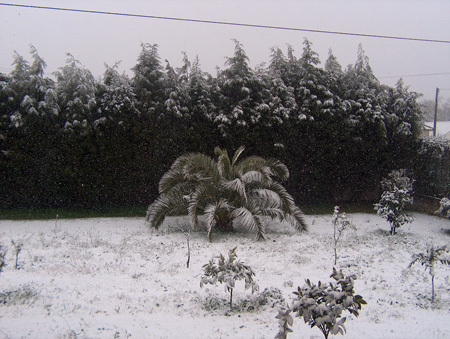 Snow is rare in Portugal, isn’t it? But what pretty pictures you got to remember it by! I’m so glad you are not ashamed to show off your knitting! You do such nice work and maybe you will get other people interested as well!